One of the most prestigious tournaments of the 2014 World Series of Poker—the $50,000 Poker Players' Championship – came to an end on Thursday. 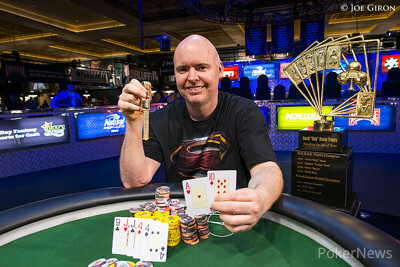 What began with 102 of the world’s best players tested their mettle in an eight-game rotation, and after five days of play it was John Hennigan that emerged as the last man standing to capture the $1,517,767, a WSOP gold bracelet, and etch his name on the Chip Reese Memorial Trophy. This marked Hennigan’s third straight cash in the Poker Players’ Championship, and his second consecutive final table after finishing third last year. It was an exciting moment for Hennigan, though after the win all he wanted to do was jump straight into the $10,000 Limit Hold’em Championship, which he promptly did after completing the obligatory winner’s photo and post-game interviews. There’s no rest for the wicked, nor is there for “Johnny World” even after winning his third gold bracelet. Day 5 saw the final eight players return to action, and it didn’t take long for the first two eliminations to occur, both of which happened in stud hi-low. The first to go was Allen Kessler, who claimed to have missed a flush draw against Abe Mosseri. 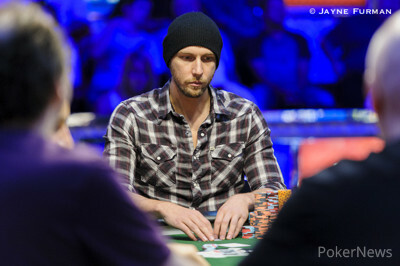 Kessler was the short stack when play began, and he took home $134,101 for his eighth-place finish. That meant the official final table of seven was set, and one player that was excited to be there was Melissa Burr, who became the first woman to ever cash in this event and by doing so won a $500 bet at 15-1 against Robert Mizrachi. As an added bonus, she became the first woman to ever final table this event, though her journey came to an end in seventh place when she ran into the quad aces of Hennigan. Frank Kassela, the 2010 WSOP Player of the Year, was the next to go after he got his short stack all in on third street in stud. Hennigan ended up making a pair of tens on seventh, and that was enough to dispatch Kassela in sixth place for $212,829. Not long after, Brandon Shack-Harris limped under the gun (he would later admit that he thought he was putting out the big blind), and that inspired three other players to do the same. The flop saw three players checked to Hennigan, and he bet 80,000 from the button. Mosseri called from the small blind, and then online superstar Chun Lei "samorstan" Zhou check-raised to 160,000. Shack-Harris folded, the other two players called, and three players watched the dealer burn and turn the . Mosseri checked, Zhou bet all in for his last 160,000, and both Hennigan and Mosseri called. The two active players then checked the river. Zhou's two pair was no good as Mosseri had a flush for the high and Hennigan an 8-7-4-2-A low. The last of Zhou's chips were chopped up and he exited in fifth place for $286,122. Mosseri, who finished 11th in this event back in 2010 for $129,957, bowed out in fourth place (not beforecleaning up in some side bets), and then three-handed play became an extended affair. Hennigan was on the verge of elimination during this time, but managed a double in pot-limit Omaha. From there he seemed to do nothing but collect chips, and eventually Jesse Martin hit the rail in third place. Hennigan began heads-up play with a big lead over Shack-Harris, who already had first, second, and third-place finishes at the 2014 WSOP prior to this event. Shack-Harris, who began the day as the chip leader, had high hopes of capturing his second bracelet of the summer, but he would have to settle for second place and a $937,975 consolation prize. Congratulations to John Hennigan on capturing his third WSOP gold bracelet, the $1,517,767 first-place prize, and etching his name on the Chip Reese Memorial Trophy! John "World" Hennigan bests a field of 102 players to capture the prestigious $50K buy in WSOP Poker Player's Championship. 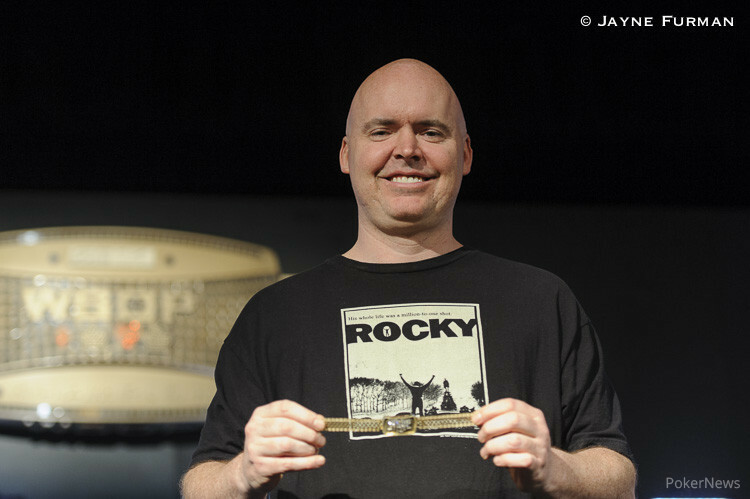 He captures the top prize of $1,517,767 , a WSOP gold bracelet, and gets his name etched on the Chip Reese Memorial Trophy. Brandon Shack-Harris, who dropped down to 320,000, managed a double in the last hand of 2-7 triple draw, but he would fall when the game changed over to no-limit hold'em. In what would be the last hand of the tournament, Shack-Harris moved all in from the button and John Hennigan called him. Shack-Harris was behind, but he was drawing to two live cards. The flop was no help to Shack-Harris, and neither was the turn. Shack-Harris needed either a king or seven to stay alive, but it wasn't meant to be as the blanked on the river. Shack-Harris, who already had first, second, and third-place finishes at the 2014 WSOP prior to this event, is nipping at George Danzer’s heels in the Player of the Year race, and his finish in this tournament will no doubt make it an even more heated affair. Brandon Shack-Harris raised on the button, and John Hennigan called. Hennigan led out on every street - betting dark after the second draw - and Shack-Harris picked up his cards off of the felt on seventh, sighing. "I hit my gut-shot," he said, showing a straight. Hennigan fanned an eighty-six, and dragged the pot. John Hennigan raised to 400,000 on the button and Brandon Shack-Harris called from the button. Shack-Harris drew two, Hennigan three, and then Shack-Harris led out for 200,000. Hennigan popped it to 400,000, Shack-Harris called, and then both players drew one. Shack-Harris check-called a bet of 400,000 before drawing one. Hennigan stood pat. Shack-Harris checked, Hennigan bet 400,000, and Shack-Harris folded. The final two players are now on another 20-minute break. When they return they will be playing 2-7 triple draw. Hennigan brought it in, Shack-Harris completed, and Hennigan called. Hennigan led out on every subsequent street, Shack-Harris called him down, and Hennigan showed for queens and threes. Shack-Harris flashed for a busted open-ended straight draw. Brandon Shack-Harris raised to 300,000 from the button and John Hennigan called from the big blind, which brought about a flop of . Hennigan checked, Shack-Harris bet 150,000, and Hennigan called. Hennigan then checked for a second time on the turn but check-raised to 600,000 when Shack-Harris bet 300,000. Shack-Harris made the call and then both players checked the river. Shack-Harris tabled the for nines, and Hennigan mucked. Who Will Walk Away as the 2014 WSOP $50,000 Poker Players' Champion?